Product Description: Purchase a gift certificate today to share a gift of health and wellness with your family and friends! 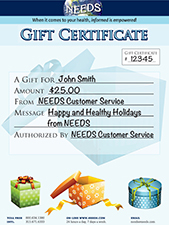 Just add your desired gift certificate amount to the Value box. You can choose as little or as much as you like, whatever fits your budget! Additional Info: Gift certificates purchased through our website will be sent to you directly, along with your order.